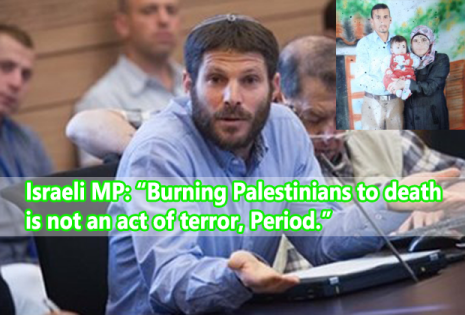 Israeli Knesset Member Bezalel Smotrich stated on Thursday that he did not consider the burning to death of a Palestinian family to be an act of terror. His statement came on the same day that the main suspect in the attack, an Israeli right-wing settler, was released from prison.Smotrich published a column in the B’Sheva weekly newspaper, saying that the attacks carried out by extremist Israeli settlers, including so-called “price tag” attacks, are not to be classified as terrorism. He wrote, “The murder in Douma is not an incident of terrorism, Period.” He added, “Whoever calls it terrorism is deviating from the truth, causing mortal and unjustified harm to human and civil rights’. Israeli security arrested a man — a Shin Bet agent, according to ‘Days of Palestine’ — suspecting him of taking part in the attack, but refused to charge him, claiming there is not enough evidence against him. The authorities released him and only put him under house arrest for five days. Smotrich criticized this arrest, claiming this would lead to [the extremist right-wing Jewish] community feeling oppressed. He then continued with this line of thought, saying that this feeling would lead to an explosion of violence carried out by these right-wingers. Then, “no one should be surprised when that happens, when more and more people are pushed against their will into acts that they must not commit,” Smotrich wrote.